"Flying Heron" is a simplistic, elegant art piece depicting a heron taking flight. 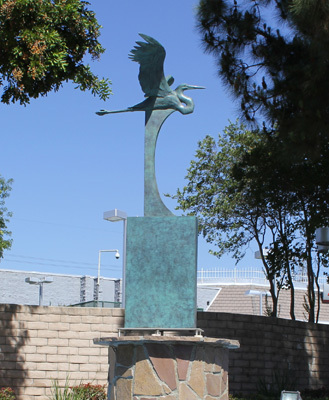 It was created by artist Darrell Davis and was installed at the Cerritos Mitsubishi site in December 2013 where it serves as a gateway to the Cerritos Auto Square. The art piece is 7 feet tall, 3 feet wide and 4 feet deep. 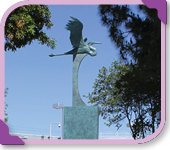 It is cast in bronze and is a limited edition of eight. The statue was installed on an existing fountain pedestal at the site and is enhanced by water jets and lighting. Davis specializes in sculpting wildlife figures and has been a recognized sculptor for more than 20 years. He has installations throughout the country, including in Colorado, Florida, Illinois, Maryland and Texas. He has received numerous national honors and awards, including the President's Award from the American Artists Professional League in New York and the Sculpture Award of Merit from the American Society of Marine Artists in Virginia.